Forget boring white and stainless steel – the newest trend for appliances is black. The sophisticated new look goes well with other black appliances and can even serve as a great talking point that draws the eye in your home. It’s not a look for everyone, but black appliances can offer texture and depth for both the kitchen and laundry room in particular. Whether it’s a black refrigerator and dishwasher or a black oven and microwave you want to add to your space, there are several brands on board with this colour scheme. The laundry can also have a makeover with several black washing machines now on sale. So, to help deck out your home in the latest trend, we bring you this guide on where you can get your hands on the best, black, appliances in Australia. LG has an extensive range of fridges coming in the colour black. Whether you’re looking for something quite simple or want a fridge with the works, LG has plenty of options to consider. It’s 708L French Door Fridge in Matte Black Stainless Steel (GF-V708MBSL) features LG’s ‘InstaView Door-in-Door’ where the contents inside are illuminated with a simple knock on the glass panel. The idea is not just to save you the effort of opening the door to see what’s inside, but to help reduce energy usage as opening the door means the fridge will need to work harder to regain its temperature. This high-tech design, however, will set you back $4,799 (RRP). If you’re after something smaller, the LG 450L Bottom Mount Fridge (GB-450UBLX) boasts a sleek design with anti-fingerprint shiny steel. It has three tempered glass shelves and six door baskets. And similarly to the model above, It’s equipped with a Smart Diagnosis App that troubleshoots any fridgey problems. The recommended retail price tag for this model is $1,299. It has a 4.5 star energy efficiency rating while the 708L model above is only 2.5 stars. 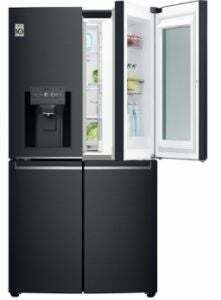 Sharp also has several black fridges on offer, including the almost-intimidating Sharp SJXP580GBK 581L Top Mount Fridge ($2,099 RRP) and SJFJ676VBK 676L French Door Fridge ($3,299 RRP). 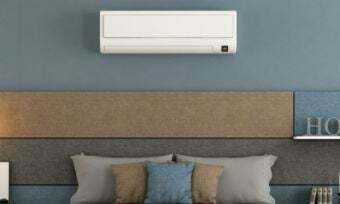 The 581L model is in Sharp’s Premium range, and features a specifically-designed inverter and ECO mode for consistent cooling and energy savings. It’s rated 3.5 stars for energy efficiency and will cost around $124 in energy per year, according to the Standard Test. The SJFJ676VBK fridge, while slightly higher in price, also features a wide variety of shelves and storage drawers, ideal for a family of five or more. Despite its additional features – such as the Hybrid Cooling System that ensures fresh and frozen food remains preserved at a stable temperature – it has an energy efficiency rating of 2.5 stars. It should add approximately $184 to your electricity bill each year. Fisher & Paykel has a number of different black ovens available, designed to match the rest of its kitchen appliance range. The 60cm OB60SL11DEPB1 Built-in Oven, with 90L capacity, is boasted for 11 functions, including a pyrolytic self-cleaning feature, designed to break down food residue. The black glass finish has a stainless steel handle with a ‘CoolTouch’ door that’s claimed to have quadruple glazing compared to other models and a cooling system to protect your hands and surrounding cabinetry. 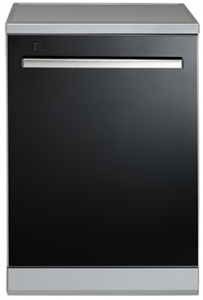 Another model with a black design finish is the Fisher & Paykel 60cm OB60NC9DEX1 55L capacity Built-in Oven. It features nine cooking functions and catalytic liners, claimed to break down oil and fat splashes during cooking. This model has a retail price tag of $1,699, while the 90L capacity oven costs $2,649. If you’re looking for a black oven at the very top of the range, Miele is one to consider. Miele’s H 6461 BPX 60cm-Wide Handleless Oven is priced at over $5,000, but it packs a punch in terms of features. It’s designed with a pyrolytic cleaning program for easy maintenance, TFT text display with touch operation and Touch-2-Open door. No, it’s “not wizardry, just Miele”, the handleless door opens smoothly via the corresponding symbol, and with the additional SoftOpen technology, Miele claims the door opens softly up to 90° and is cushioned when moved back into the end position. 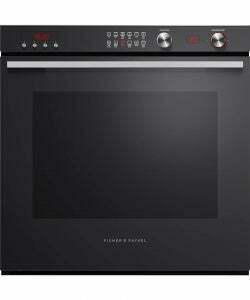 Another Miele oven with an obsidian black finish is the H 2661 B 60cm-Wide Oven. It has a 7-segment display with a rotary selector and ‘PerfectClean’ design, claimed by Miele to make persistent soiling easy to remove with the non-stick properties of each component. It also boasts an XL cabinet, with 76L oven capacity. Unlike the model above, this oven has a stainless steel handle but also features a cool front for protection from burns. This model will set you back $2,000. 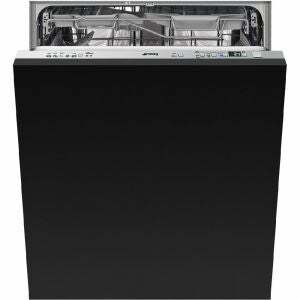 Smeg offers an extensive range of black dishwashers – one of which is the Smeg 60cm Fully-integrated Dishwasher (DWAF16D15PO). It’s designed with 15 place settings and boasts a sleek push to open door design. It also comes with for Smeg’s ‘Planetary’ wash system, featuring a single wash arm which rotates around two axes to increase the wash pattern density and the cleanliness of the wash, plus it has angled jets to enhance the intensity. Expect six-star WELS water efficiency ratings and four stars for electricity efficiency. The DWAFI6D15T model also has a high water-efficiency rating, with its ‘Active Acquastop’ system that determines when and how much water to let into the dishwasher. The design features an internal light to provide visibility and fully adjustable baskets. It has a four-star energy efficiency rating and you can expect to pay around $69 per year in energy costs (based on 28.5 c/kWh). In terms on noise levels, both models are stated to produce just 42dB, allowing you to make use of the off-peak electricity times with minimal disturbance to anyone sleeping in the house. 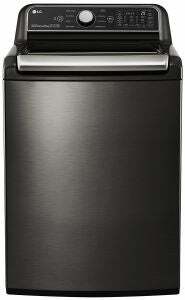 Euromaid only produces one freestanding dishwasher with a black finish – the BG14BM. It features 14 place settings, with a fully adjustable top basket to help fit plates as large as 31cm in the bottom shelf. It has ‘Auto-Wash’ sensors, claimed to automatically adjust the wash and temperature to save money in running costs. With a three-star energy-efficiency rating, it should add approximately $89 to your annual power bill. Other features include a 30-minute quick wash program, as well as an Eco-wash. Its retail tag stands at just over $1,000. LG is always one to keep up with the latest innovations and trends in home appliances, providing several black microwave ovens. 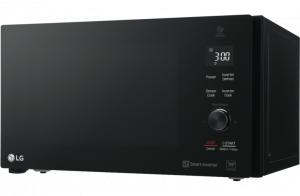 The LG NeoChef 42L Smart Inverter Microwave Oven (MS4296OBS) is designed with a sleek minimalist design, easy touch controls and a tempered glass door. It boasts ‘Anti-Bacterial EasyClean’ interior coating for easy maintenance and has a stable turntable, designed with a hexagonal ring. Expect to pay over $300 for this model. There are several other models similar to the above that come in a black finish, including the NeoChef 25L model (MS2536DB) priced at $199 (RRP). It has the same single piece of tempered glass on the front door to create the modern, stylish look. It boasts LG’s Smart Inverter for even defrosting and cooking as well as versatile cooking. Its interior white LED light is also claimed to be three times brighter and energy efficient than the other LG microwave ovens. 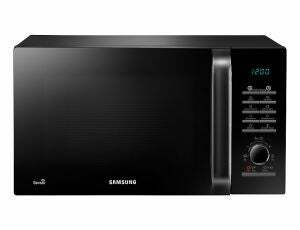 Samsung’s 32L MS32H5125AK microwave has an elegant black crystal gloss design with ceramic enamel interior. It features six power levels, with a Smart Moisture Sensor, stated to detect the humidity level of your food and suggest a suitable cooking time and power. It also brings 14 pre-programmed settings for convenience including a soften/melt function. A slightly smaller model is the Samsung 28L ME6104ST1 microwave. Expect similar design features, such as the ceramic enamel interior, claimed to be scratch-resistant and easy to clean, as well as the humidity sensor. Furthermore, it has an auto soften and melt function. Who Sells Black Washing Machines? 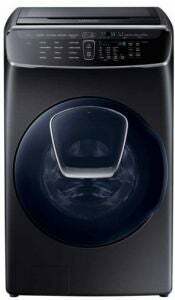 There isn’t a great deal out there just yet when it comes to black washing machines, but with Samsung’s latest edition – the 16Kg FlexWash Front Loader WF16J9800KV – there’s bound to be a few more brands to join the pack soon. This large washer is designed with Samsung’s ‘Add Door’ feature, allowing you to add in any forgotten pieces of clothing or fabric softener after your wash cycle has started. It also has an ‘Auto-Load’ sensor for water efficiency and connects to the Smart Check app for troubleshooting. While it’s has a modern, sleek design, it does come with a price – $2,099 RRP. In Samsung’s top loader range, you’ll also discover a couple of black models – the 13kg Activ DualWash WA13M8700GV and the 11kg Activ DualWash WA11M8700GV, both of which are boasted for two large ‘Magic Filters’, designed to gather lint and other particles. Additionally, they feature a soft close lid and sink, as well as Samsung’s Vibration Reduction Technology to reduce noise during washes. Both models have three-star energy efficiency ratings and are priced at $1,899 and $1,699 respectively. LG’s latest top loader comes in a sleek black design. The WTR1132BF is boasted for its Six Motion Direct Drive, based on hand-washing. It also features a tub clean cycle to help remove any detergent built-up and other residue for easy maintenance. Similarly to Samsung, LG washing machines link up to an app – the LG Smart THINQ – to troubleshoot any issues. This LG model has a three-star energy efficiency rating and should add around $188 to your energy bills per year. The recommended retail price for the LG top loader is $1,599, sitting in a similar price bracket to the Samsung range. Should I hop on the black appliance craze?